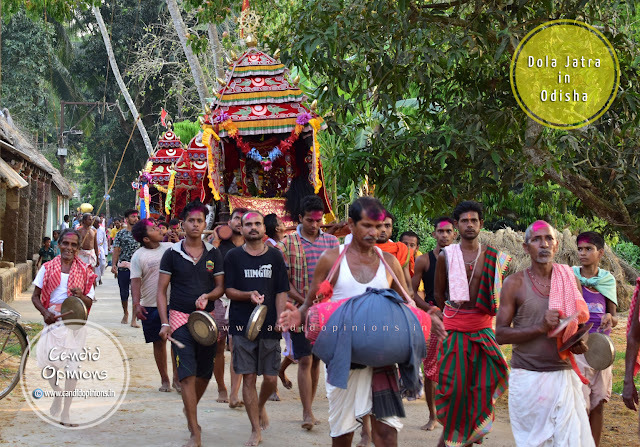 Dola Jatra or Dola Utsav is another very popular socio-religious festival in Odisha that reflects the unique cultural traditions and religious customs of the state. Also known as "Basant Utsav" or the spring festival, Dola Jatra is actually a precursor to the main Holi festival. It is celebrated with pomp and gaiety across the state for five days in the month of Phalguna, commencing from "Fagu Dasami", the tenth day of the bright fortnight (Sukla Pakhya) and continues until the full moon night (Dola Purnima or Dola Purnami). In some villages however, the festival continues for around ten days. (You may also want to read my other article about Panchu Dola Melana at Balanga here). 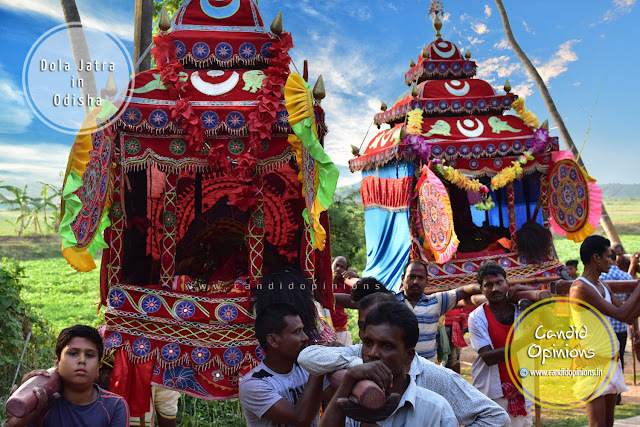 During Dola Jatra, the "Chalanti Pratima" (or representative movable idol, usually made up of brass) of Sri Krishna (or Madana Mohana) is seated in a palanquin (a portable temple like structure also known as "Vimaana") which would have been wrapped with artistically handcrafted "Dola Mandanis" replete with elegant Pipili applique works on the cloth. 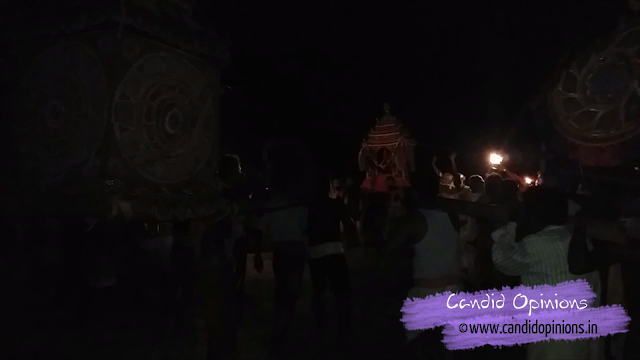 The 'Vimana' is then taken out in a procession from the temple and is moved around in the village by "goudas" (people from the cowherd community), accompanied by the "ghantuas" (those who play the metal gong striking it with a wooden rod), the drummers, the pipers and the 'sankirtan mandalis' clashing cymbals, blowing conch shells and chanting "Hari Bol" all along the way. 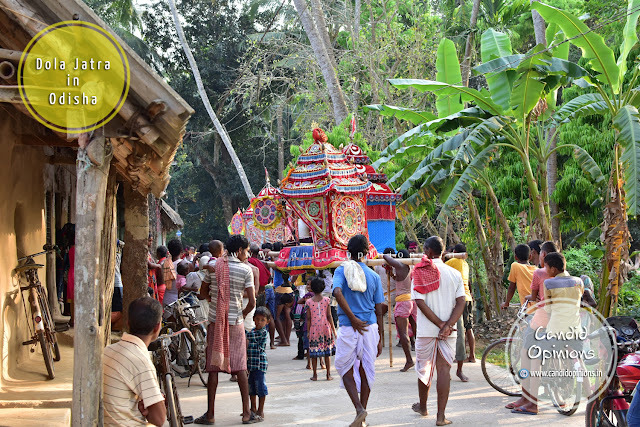 The procession stops at the entrance of each house where the deity is offered 'Bhoga'. These daily tours of Sri Krishna taken out in procession in a palanquin for the four days are called "Chachery". Dola Utsav is also observed as the swing festival of Lord Krishna, owing its origin to the divine love story of Sri Krishna and Radha during their growing up years in Brundaban when He used to play swing with her. The word "Dola" is derived from "Doli" (or swing) and thus Dola Utsav derives its name. As per a mythological legend, when Sri Krishna was a young child, one day He complained to Mother Yashoda about his dark complexion and wondered why Radha was so fair. In reply, Mother Yashoda playfully suggested that He could smear any colour on Radha’s face and change her complexion. Fascinated by the idea, Sri Krishna did exactly that, smearing "Fagu" or "Abhira" (dry coloured powder) on Radha's face and so also on other gopis. Thus the festival of colours, Holi, originated. 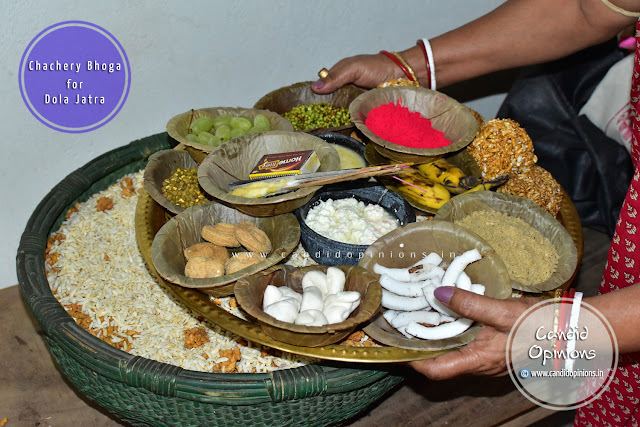 Accordingly, in Odisha, it has been a prevailing customary practice to first offer "Fagu" or "Abhira" to Sri Krishna during Dola Jatra (as a mark of respect to the God), before applying colours on each other on the day of Holi. Similarly raw mangoes too are first offered to the Lord during Dola Jatra before they are consumed by people. too visit our village Biswalpada for partaking in Dola Utsav. 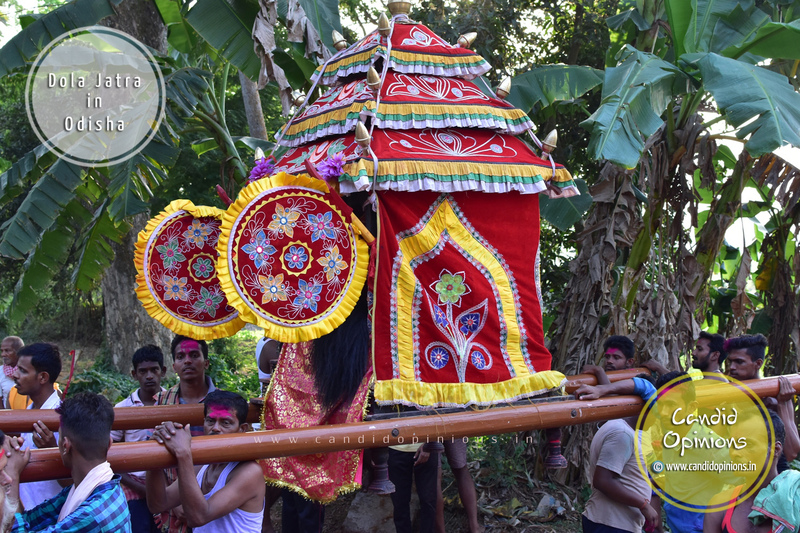 As per the custom, after Dola Purnami day and Holi, an invitation is first sent from our presiding deity to these three villages, following which their deities arrive at our village on the determined date in a procession. Accompanied by the host (our village deity Shri Lakhmi Janardan), the individual "vimanas" carrying the "chalanti pratima" of the three visiting deities are then moved around in our village where they are offered Dola Bhoga. Exhaustive arrangements are made for the same and due rituals are followed, like firstly a kalash is installed at the entrance of each house i.e. a pitcher made of terracotta and filled with water is placed over a handful of "dhana" (paddy grains). It is then topped with a small mango twig having either 5 leaves or 7 leaves. A coconut, wrapped in a red cloth ("naali saalu kanaa") is placed over the mango leaves to complete the "ghata sthapanaa". An earthen lamp is also lighted and placed on the "rukha" (the lamp stand made of wood). Holy water is then sprinkled on the floor after which the priest draws a representative image of Dola Mandani using white coloured "muruja" (dry, coloured powder) and over it, the Dola Bhoga is placed and offered to the deities after the puja and "aalati" (arti). An invigorating spiritual atmosphere pervades the place, what with the air reverberating with sounds of ghantas (metal gongs), cymbals and conch shells amidst the chants of shlokas and mantras. 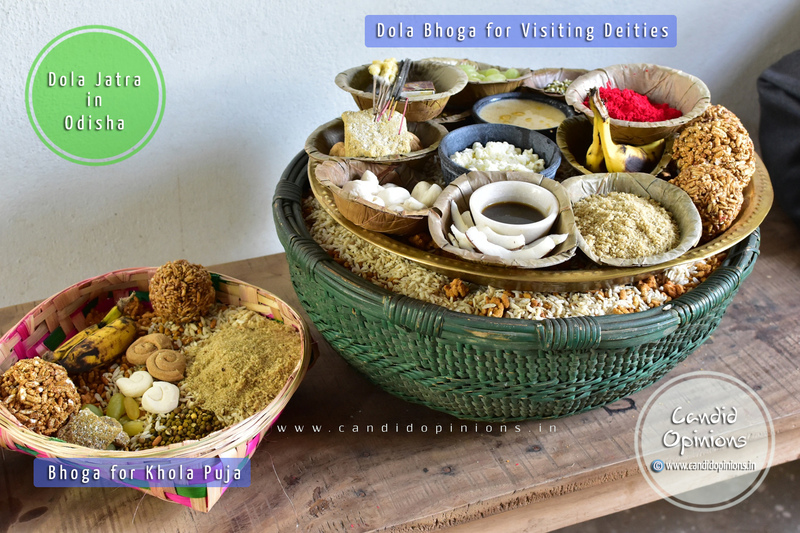 The Dola Bhoga is quite an elaborate spread comprising of "Ekapaagi Ukhuda", "Chuda Bhaja", "Chuda Pua", "Ukhuda Muan", "Nadia Paati", "Chuda Ghasa", "Khaja", "Saakara", "Bhaja Chana", "Gajaa Muga" (sprouted moong), seasonal fruits like bananas, grapes etc, "Panchamrit, "Guda Pani (a solution of jaggery in water) and "Chenna" (ricotta cheese), accompanied by "Nali Abhira" (red dry colour), "Alati Kathi, incense sticks, camphor and sandalwood paste. An additional bhoga comprising of the same ingredients but in lesser quantities, is also offered to the musical instrument "Khola" (barrel-drum) and is known as "Khola Puja". 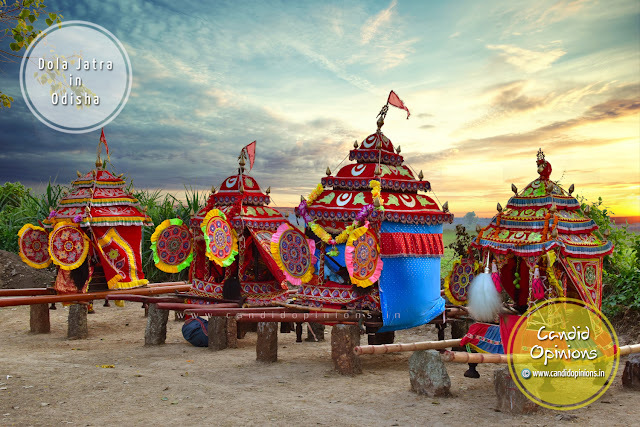 Another major attraction of this festival is the Hari Hara Bheta when the bije pratimas (or idols) of Lord Krishna (Hari) and Lord Shiva (Hara) are made to meet each other at the "Melana Padia" while still being seated in the palanquins (Vimaana). Thank you, Sneha :) Keep visiting for more of such articles. Very nicely written, I thoroughly enjoyed reading the piece. Such articles need to be promoted more so that non-Odias come to know more about our traditions and culture. Incredible pictures and beautifully described. You are doing a wonderful job, Amit bhai, promoting our state and our culture. Hats off to you. Thank you so much, Minati Ma'am :) Keep visiting my blog. This piece was quite an interesting read, Amit, Dola Jatra is something very new to me, I had no idea about this before. I'm glad I came to your blog and got to know a little about Odishan culture.